Do I need to provide a tax ID? I can't find the item I'm looking for on your website. What if you don't have everything on my order? How do I order for a trade show pickup? Why are your shipping costs different from other sites? Can you ship Parcel Post (USPS)? Can you ship Priority Mail (USPS)? Can I pick up my order from a show? Can you declare my international order as gift/no value on the customs forms? Items are missing/damaged from my order. I've received my order but I don't see my invoice. The prices on my invoice don't match your catalog. I've placed an online order but haven't received an email order confirmation. Do you accept purchase orders from public institutions? Can I get a better discount? What glaze/stain/paint brands do you carry? Do you carry Gare products? How long is an RMA good for? Where can I get SDS/MSDS safety data sheets? Would you be willing to take/purchase my used molds? There is no minimum order but every order does include a $3.95 handling fee plus shipping. Please call us immediately at 1-800-284-7299 for any order alterations. At this time only Nebraska residents must provide a tax ID to receive wholesale discounts. Those who do not will be charged retail price and sales tax. At this time not all products are listed. You can add additional products in the comments section at checkout or contact us and request a product addition. Unavailable items are usually backordered and will be marked on your invoice as such. When they become available you'll be contacted. You are not charged for any items ordered that are not shipped. For orders placed on the toll-free order line simply inform the agent which show you will be picking the order up at. Please contact us for a quote for all other orders or if shipping cost is not provided during checkout. Glaser Ceramics operates as a wholesaler. We're able to offer significant discounts because we don't hide shipping costs in our products like retail websites do. We also don't have a minimum order or require a Tax ID like many other wholesalers. This provides major savings to large buyers such as paint-your-own-pottery studios, schools, hobbyist groups, and professional artists but can leave customers used to retail websites surprised when they pay the true shipping cost. No, but free pick-up is available in-store and at any of the ceramic shows we attend. 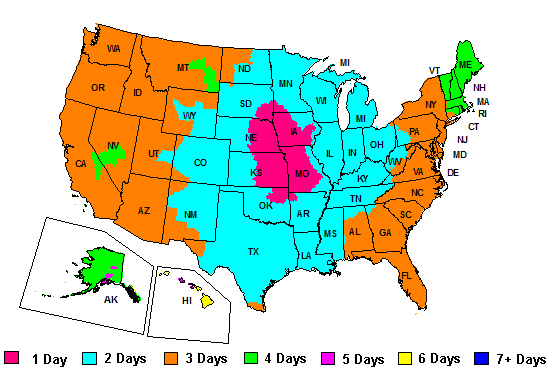 We ship Monday through Friday with most orders being processed in two business days or less. During cold weather months orders made late in the week with freezable items in them (such as glazes) may be delayed until the following week to protect against damage. Unfortunately, we're unable to ship to P.O. boxes. Please allow up to 7 business days for the arrival of your order. If your hasn't arrived by then please contact us at 1-800-284-7299 for your order status. Tracking information is also available on the bottom of PDF invoices. You will automatically receive a copy by email if you placed your order online or opted-in during a phone order. Dropshipments are orders shipped directly from the manufacturer to your door. They have the advantage of being cheaper than special ordering a product and faster than waiting for a scheduled supply shipment. When a product is dropshipped you will be charged the amount of the item plus a deposit on the estimated shipping cost (usually 25% the retail cost or $15.00, whichever is more). Once invoicing from the manufacturer is received you will either be charged the outstanding balance on the shipping due or receive a refund to your credit card for any overage. An updated invoice sent by mail and/or email. No. Parcel Post does not offer required order tracking and insurance. Priority Mail is not a standard offering within the continental United States because of large order processing time. FedEx Ground is similar in cost to Priority Mail for many orders. Our shipping department may send certain orders (such as catalogs) by Flat Rate Priority Mail at their discretion. Qualifying items will fit within a flat rate envelope or small box with packing material and must not be susceptible to bend, crush, machinery jam, or freeze damage. We do not accept CODs. Yes. Pickup is available during regular store hours (Monday through Friday, 10:00 AM to 5:30 PM central). Make sure to specify a pickup date in the comments field when ordering online. Please allow 48 hours for processing. In-store pickup is free but will still incur a handling fee. Yes. You can pick up your order for free at any of the trade shows Glaser Ceramics attends. Simply select the show you'll be attending in the "Delivery Method" area of checkout or order by phone at 1-800-284-7299. Shows are usually listed in the online checkout area and event calendar approximately 90 days before the event. For best results please place your show order as early as possible. This helps ensure we can have all your products available and that you don't miss the cut off deadline which may be several days before the event. Heavy and/or bulky items such as clay, slip, and large equipment requires special consideration for truck weight and space. Please contact us to see if they qualify for show pickup. Yes. We ship standard orders using FedEx International or DHL Worldwide and large orders by freight. Rates vary by country and address. Small orders start at $35.00 to $60.00. Local duties or taxes may also apply. To receive a shipping quote please contact us with a shipping address and a list of the supplies you're interested in purchasing (or printout of your cart). No. Orders are shipped as merchandise with full declared value. Marking a shipment as gift/no value may cause an order to be delayed for inspection and liable for the original duties and punitive costs (please see your applicable import regulations). An item is missing/damaged from my order. On very rare occasions a package may receive damage in transit or have a missing product. Please contact us at 1-800-284-7299 to have the issue addressed promptly. Make sure to have a copy of your invoice along with the order number and date (located at the top of your invoice). For missing product please ensure the item was not backordered (your invoice will be marked as shipped 0, charged 0.00) or noted on your invoice as dropshipped from the manufacturer. For damaged orders please retain any damaged packaging as FedEx may require an inspection. On orders originating from Glaser Ceramics, your invoice will be enclosed in a clear shipping pouch on the outside of the box. Small orders may occasionally have the invoice enclosed inside the box. On dropshipments, your invoice will be sent by mail. Not all the prices on my invoice match the catalog. All prices in the catalog represent the most accurate available at the time of printing but are subject to change without notice. We always attempt to keep our prices as low as possible but from time to time must raise them on select products. For the most current price for an item please consult the website or contact us for a quote. Order confirmation emails are sometimes erroneously marked as spam by some systems. Please add as a trusted email to receive invoices and notifications. For registered users, order history is also located in your account under "View your order history". Yes. We accept Visa, Discover, and MasterCard. We no longer accept American Express. Yes. Orders may be prepaid by check. An agent will contact you with an order total. Your package will be shipped when we receive and have processed the payment. Yes. Institution letterhead including the PO number must be included with the order. For more information contact us at 1-800-284-7299. Most products have quantity discounting. The more you buy the better your unit price will be. When browsing click on the product name or description for full discount. We may be able to provide additional discounts on large bulk orders. Please call us and we'd be happy to discuss options. What glaze and stain brands do you carry? We carry Duncan, Mayco, Doc Holliday, Dona's Hues, Fashenhues, Kimple, and Colors For Earth. No. For a list of their distributors please visit Gare.com. At this time we are unable to restock Hanovia products. Hanovia N Gold is sold out and remaining Hanovia items are limited to in-stock product. We recommend Duncan overglazes, Sara lusters in our lusters section as substitutions where applicable. Yes, along with being the home of Virma decals we're a distributor for Instar and TBR. A Return Merchandise Authorization (RMA) may be requested up to 45 days from the invoice date at 1-800-284-7299. All returns must have an RMA issued. Perishable items such as glazes, stains, and lusters do not qualify for returns with the exception of errors or product defect. Returns due to our error or product defect will receive full credit. RMAs due to customer error are subject to a 20% restocking fee. Glaser Ceramics Inc. reserves the right to decline issuing an RMA at any time. Upon successful inspection of the returned item(s) the appropriate refund or credit will be issued. An item may fail inspection if it is damaged, opened, not as described, or otherwise determined to be in poor condition. How long is an RMA valid for? An RMA is valid up to 30 days from the issue date. Return cost is the responsibility of the customer with the exception of errors or defects. It is the responsibility of the customer to ensure returned items arrive in good condition. Using a shipping method which offers package tracking is recommended. What is the shipping address for returns? Our 2018-2019 catalog is available for purchase (free with an order of $30.00 or more) or free download. They can be downloaded at the Mayco SDS and Duncan SDS pages. Additional safety data sheets are available upon request. Would you be willing to take/purchase my molds? We are not looking to expand our inventory at this time. Additionally we only deal with new, never-poured molds.